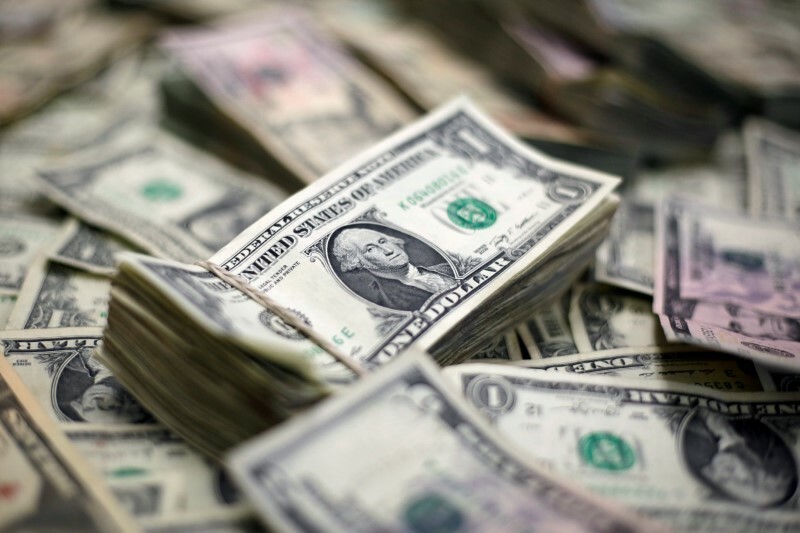 NEW YORK (Reuters) – The dollar fell off an 11-month high on Thursday against a basket of major currencies as the Philadelphia Federal Reserve’s gauge of U.S. Mid-Atlantic business activity fell to a near 1-1/2 year low, spurring profit-taking on the greenback. The euro recovered from its weakest level since July 2017 which was tied to bets on a protracted period of monetary policy divergence between the U.S. and European central banks. The single currency was also pressured earlier after the Italian government appointed two eurosceptics to head key finance committees, reigniting worries about anti-euro voices in the euro zone’s third-largest economy. “Philly Fed missed on the downside. That was a convenient excuse for traders to take profits,” said Joe Manimbo, senior market analyst with Western Union Business Solutions in Washington. The Philadelphia Fed said its barometer on U.S. Mid-Atlantic business activity fell from 34.4 in May to 19.9 in June, its lowest since November 2016. The index’s sharpest drop since January 2014 came amid escalation in a U.S.-China trade conflict, which has underpinned safe-haven support for the dollar in recent days. “It does loom as a potential headwind for the U.S. and global economy,” Manimbo said of the rising trade tensions. The world’s top central bankers at a conference in Sintra, Portugal on Wednesday acknowledged that a serious dispute with more tariffs would weaken their economic outlook, although they have not altered their policy stance for now. At 10:25 a.m. (1425 GMT), an index that tracks the dollar against the euro, yen, sterling and three other currencies (DXY) slipped 0.1 percent to 94.926 after touching 95.529 earlier Thursday, which was its highest since mid-July 2017. The euro rebounded from an 11-month low to $1.1592 (EUR=), while the greenback decreased 0.4 percent to 110.93 yen . Elsewhere, sterling rose over 0.5 percent at $1.3243, recovering from a seven-month trough after the Bank of England’s chief economist, Andy Haldane, unexpectedly joined those calling for rates to rise to 0.75 percent, citing concerns about growing wage pressure. Haldane’s vote, however, was not enough to flip the BOE’s decision to leave key borrowing costs at 0.5 percent. Meanwhile, even as the Swiss National Bank as expected clung to its negative interest rate policy, the Swiss currency rose against the euro (EURCHF=) to 1.1499 franc as some traders saw a slightly more hawkish tone from the central bank. Norway’s central bank also kept rates on hold but said it was on track to raise rates in September, sending the Norwegian crown to an eight-month peak versus the euro (EURNOK=D3) at 9.3900.